turn of the century. what a hero. check his wiki page, it's brilliant. "At the end of the first match in the 1902 Cup Final Foulke protested to the officials that Southampton's equalizing goal should not have been allowed. 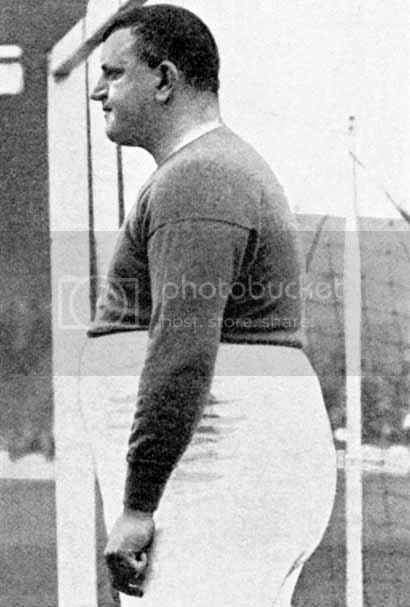 Foulke left his dressing room unclothed and pursued the referee, Fred Kirkham, who took refuge in a broom cupboard. Foulke had to be stopped by a group of F.A. officials from wrenching the cupboard door from its hinges to reach the hapless referee." He was no bigger than my dad. My dad's about 15st. Legend. From The Manageress TV series. Gresley Rovers' current keeper is a fairly impressive size. Looked better on Bodo Ilgner though.